BLUE MAGIC WAS FORMED IN PHILDELPHIA IN 1972. 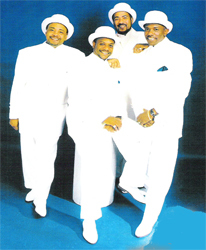 BLUE MAGIC WERE ONE OF THE EARLIEST ACTS PRODUCED BY NORMAN HARRIS A PHILDELPHIA RECORDS VETERAN. EARLY RELEASES WERE MAINLY CONFINED TO THE R&B CHARD. BLUE MAGIC BECAME POPULAR IN 1974 WITH THEIR FIRST MILLION SELLING U.S. TOP 10 HIT SINGLE "SIDESHOW" AND "THREE RING CIRCUS", BOTH WERE WRITTEN BY BOBBY ELI. THEY BECAME KNOWN MOSTLY FOR THEIR SMOOTH BALLADS. BLUE MAGIC HAD TWO R&B CHART SINGLES IN 1975 AND FOUR IN 1976. THEIR SONG, WHAT'S COME OVER ME WAS A HIT TWICE: THEY RECORDED IT ON THIER FIRST ALBUM. IN 1975 THE GROUP HAD THEIR FIRST WORLD TOUR, WHICH LASTED SIXTEEN WEEKS. THE TOUR INCLUDED FORTY EIGHT STATES IN THE UNITED STATES, FIVE COUNTRIES IN EUROPE, AND TEN DAYS IN THE PHILIPPINES. BLUE MAGIC CONCLUDED THEIR TOUR WITH A FOURTEEN DAY ENGAGEMENT IN THE VIRGIN ISLAND IN APRIL 1975 THEY WERE CHOOSEN AS THE BEST NEW GROUP OF THE YEAR WHICH EARNED THEM AN EBONY AWARD.